In the days of King Arthur there stood a mighty oak tree within the walls of a castle. Peace reigned in the castle until the fearsome night when Lionel, longlost brother of Lord Weldon, returned to cause trouble and unhappiness. 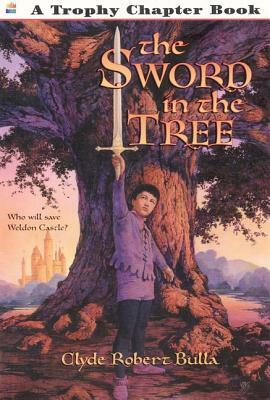 It was then that Shan, the son of Lord Weldon, took on the duties of a knight and hid the sword in the hollow of the giant oak. The days that followed were filled with adventures that tried the courage of the young boy. Shan was surprised by bearded robbers in the woods. He met noble knights in plumed helmets, and eventually he even made a trip to high-towered Camelot. His story is filled with the pageantry and color of England in King Arthur's time. It creates a vivid picture of the Knights of the Round Table and the wisdom of King Arthur himself. Mr. Bulla captures the spirit of those romantic days in a straightforward, exciting manner. The result is another delightful book for his wide audience of young readers. Paul Galdone's vigorous illustrations are as evocative as the text. Clyde Robert Bulla is the author of over fifty books for children including The Secret Valley and The Story of Valentine’s Day. He has been writing since 1946 when he published his first book, The Donkey Cart. Mr. Bulla was the first recipient of the Southern California Council on Children’s Literature award for distinguished contribution to the field. He lives in Los Angeles, California. Bruce Bowles was raised in Ft. Walton, Florida, and is a graduate of Art Center College of Design. His imaginative style has earned him several awards from the Society of Illustrators. Mr. Bowles lives in Oakland, California, with his wife, Mindy.